Today, every vital sector of the economy starting from agriculture to packaging, automobile, electronics, electrical, building construction, communication sectors has been virtually revolutionized by the applications of plastics. Plastic is a non-biodegradable material and researchers found that the material can remain on earth for 4500 years without degradation. The plastic waste quantity in municipal solid waste is increasing due to increase in population and changes in life style. Thus disposal of waste plastic is a hazardous and become a serious problem globally due to their non-biodegradability. 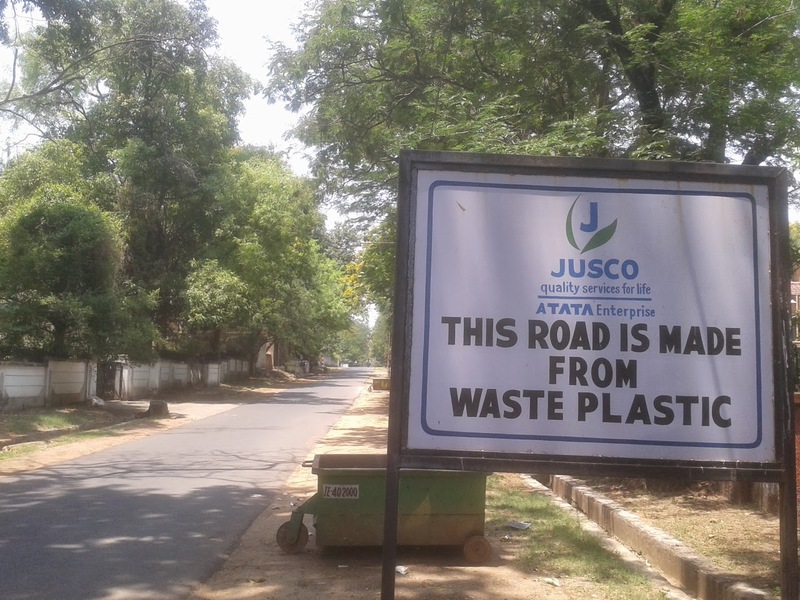 The roads using plastic waste are found to perform better than ordinary roads and therefore use of plastic road construction has gained importance these days. Disposal of waste plastic bags has become a serious problem and waste plastics are burnt for disposal which causes environmental pollution. Utilization of waste plastic bituminous mixes has proved that these enhance the properties of mix in addition to solving disposal problems. In that direction, Indian state Maharashtra recently allowed the use of plastic waste, other than black plastic and PVC, in building asphalt roads in the state. Every 100 kg of tar used to build asphalt roads will have three to six kg of plastic (mostly plastic carry bags) mixed in it. The move will not only save asphalt but will also help reuse plastic waste to reduce soil pollution. "We will build 100 km roads this year using this formula. For next year, the target is of 1000 km. So there is less probability of you getting potholes during monsoon as all municipal corporations and councils will be able to do so," said a senior PWD official, as reported by TOI. The move will not only save government's money and decrease pollution but will also increase the durability or longevity of the roads by three years. Apparently the government has decided to take the help of schools across the state wherein the students will help collect plastic bags and other plastic materials such as carry bags, sacks, milk pouches, bin lining, cosmetic and detergent bottles. The official clarified that the government has received assurance from the CSIR(Central Road Research Institute) that these roads will not only offer improved quality, but will also be cheaper. Studies reveal that plastic waste offers considerable potential for use in bituminous construction.